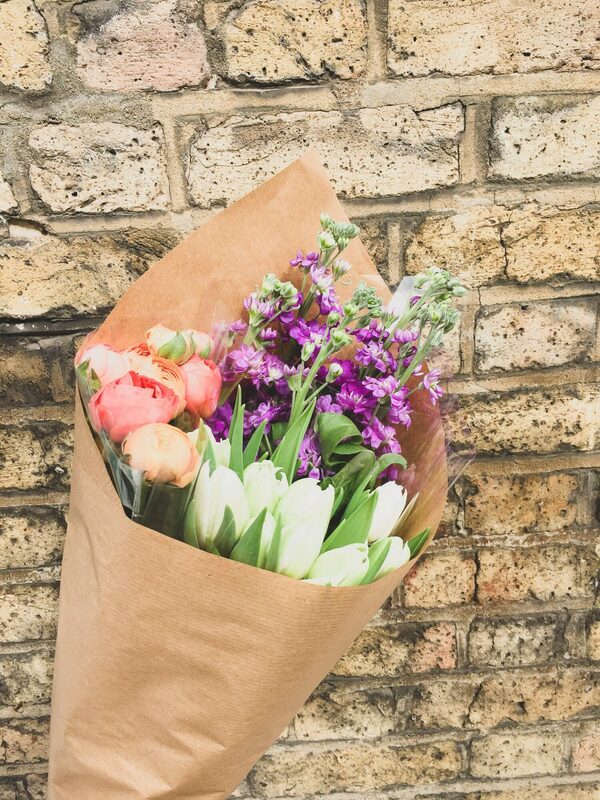 Every Sunday, the sleepy Columbia Road awakens and transforms into a bustling London flower market. It comes alive as the cute, independent shops open and the flower stalls take pride of place and line the street. 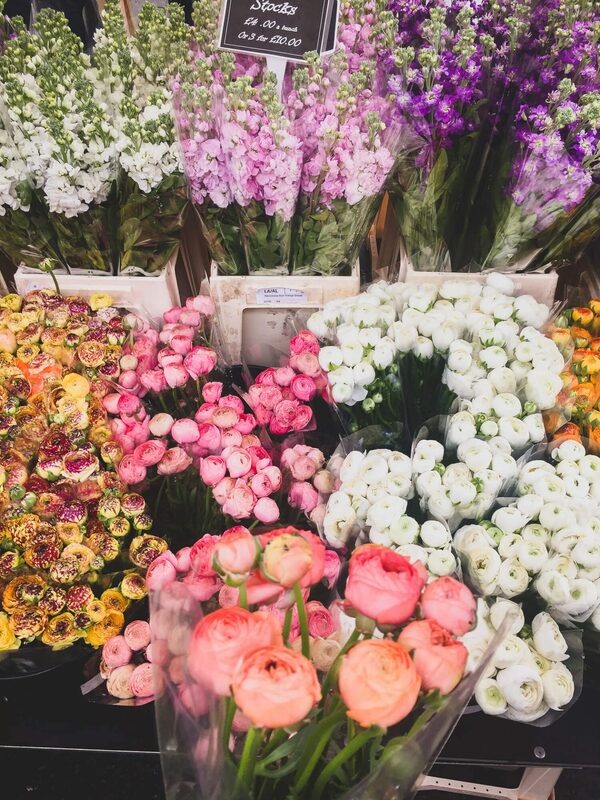 I love to spend a sunny Sunday morning wandering around the stalls of Columbia Road Flower Market picking up beautiful and great value flowers and plants for my home. 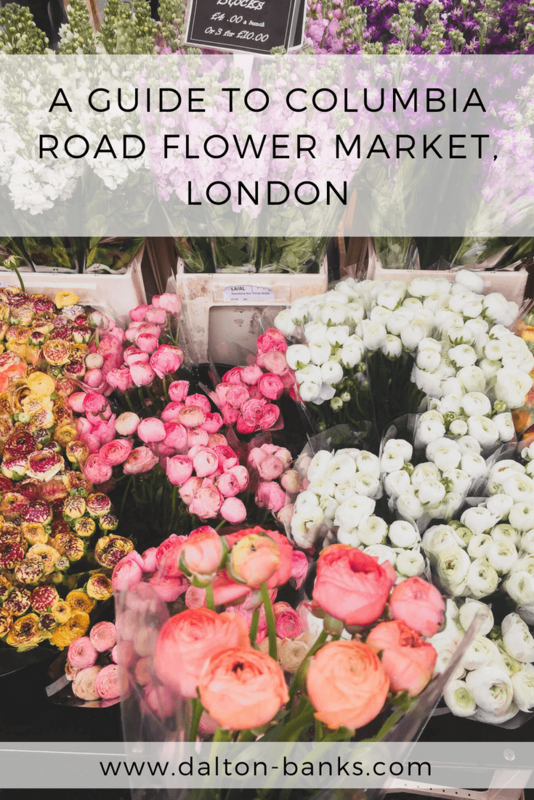 Wether you are just visiting London for the weekend or whether you live in London, I definitely think you should pay a visit to Columbia Road Flower Market! As with most great things to do in London, they become very popular and therefore very busy! The first couple of times I went to the flower market I didn’t get what the fuss was about and in fact I found it quite stressful. It was just too busy and I could neither really get to the flowers nor could I get to the front of the coffee queue! But, I’ve been many times since and now love to explore the market peacefully alone or with friends (it’s not the husbands first choice at all, haha). 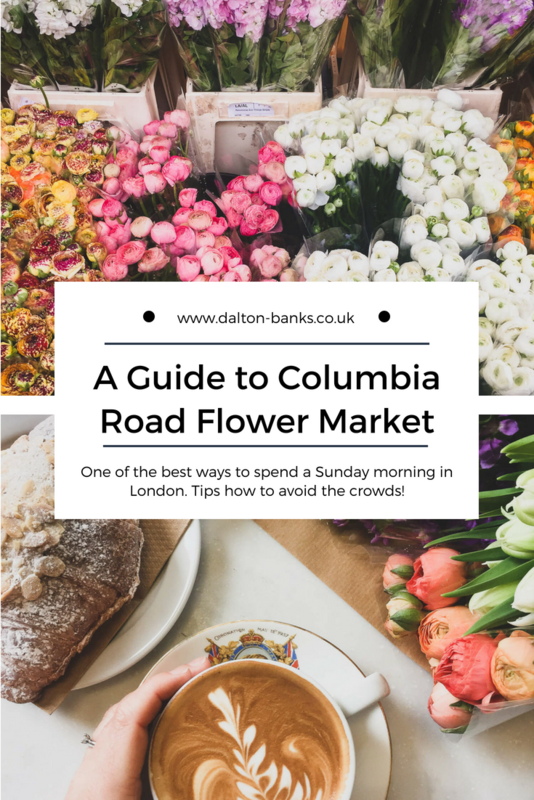 So I’m here to share my wisdom and impart some tips to make sure you enjoy your trip to Columbia Road Flower Market! 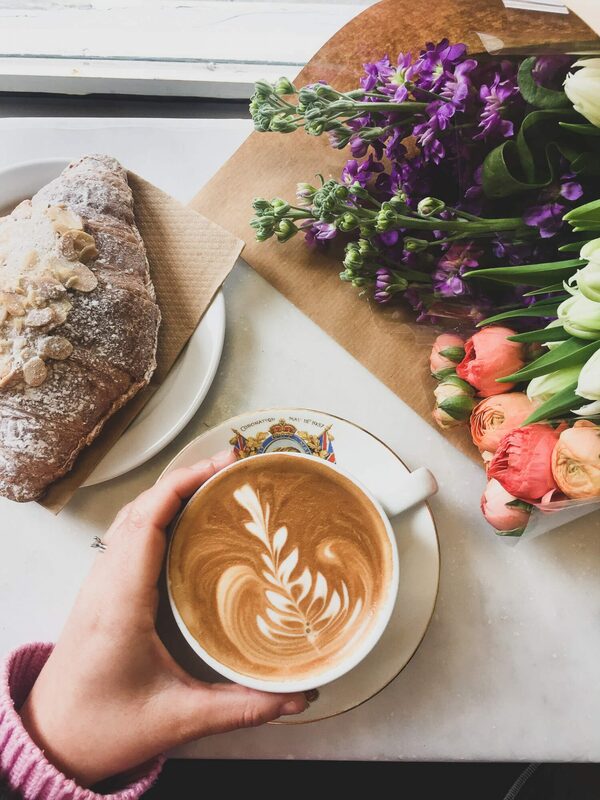 There are a number of little hole in the wall places to grab a coffee to go or cute little cafes to sit in and watch the Londoners go by. I love people watching from Start Space Coffee Shop with my coffee and croissant! Also, there are some great pubs close by which would make the perfect spot for a relaxing Sunday lunch after your morning London walk. 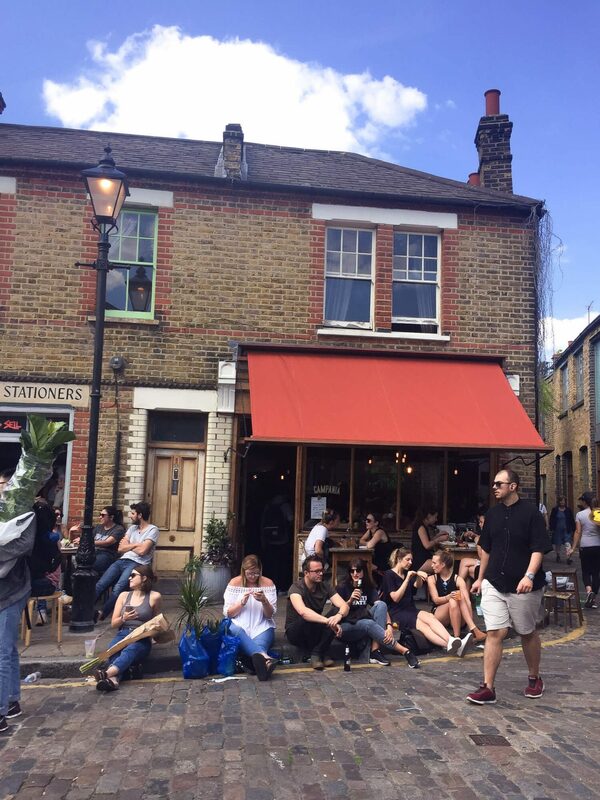 There is such an amazing atmosphere at Columbia Road Flower Market, especially on sunny days. 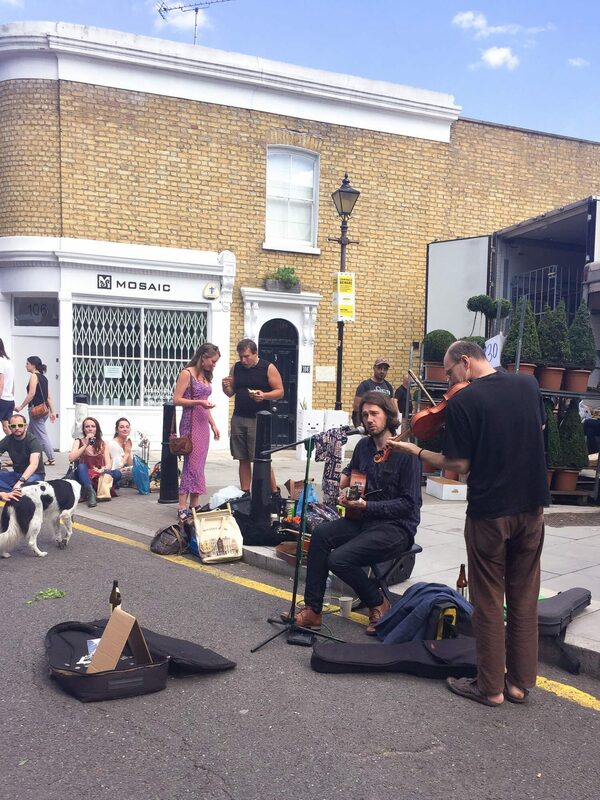 You’ll find musicians on various corners (by Campania or at the Shoreditch end of the road) playing their instruments or singing and people will be sat on the pavements watching, eating and drinking. It’s honestly become one of my favourite spots in London for a sunny Sunday! The flower markets starts at 8am and starts to die down around 2pm/3pm. There are two ways to avoid the crowds, one is too arrive late in the day at about 2:30pm/3pm when there is not much stock left and most flowers will become discounted. But for me personally, I don’t want to miss out on the good stuff! If you want to pick up some stunning flowers or plants then get there early! Columbia Road Flower Market starts at 8am. If it’s a bright, sunny day in the warmer months then I like to get there around 8:15am. There are already quite a few people there! It’s got a nice buzz but you can actually move around and see the flowers. There is something to be said about getting up before the rest of London on a Sunday morning. And on a bright sunny day I absolutely love it. There is such a calmness over London – its my favourite time! If you are visiting in the depth of winter you can push this back to 9am/9:30am. The weather definitely has an affect on how busy the flower market gets as it is open to the elements. Oh and make sure you’re dressed for the weather as if it’s raining there is no cover! Also, a little extra tip – once you are finished shopping and you need to get to the other end of Columbia Road, don’t try and make your way painfully slowly back through the tide of people. Behind the stalls on each side you can walk down the back. With barely anyone doing this this is a great speedy trick. Okay this might be obvious but the amount of times I’ve forgotten to bring cash to pay for my flowers! There is one cash point (that you have pay for) but you can imagine the queues and if it’s out of service then it’s quite a walk to the next one. Some stalls do take card over £10 but not all of them so go prepared! Also, when I arrive I make my way up and down to scout out the best prices before I decide what to buy. Usually there is not much variance in the price for the bunches of flowers, but sometimes one stall is a pound or two cheaper. 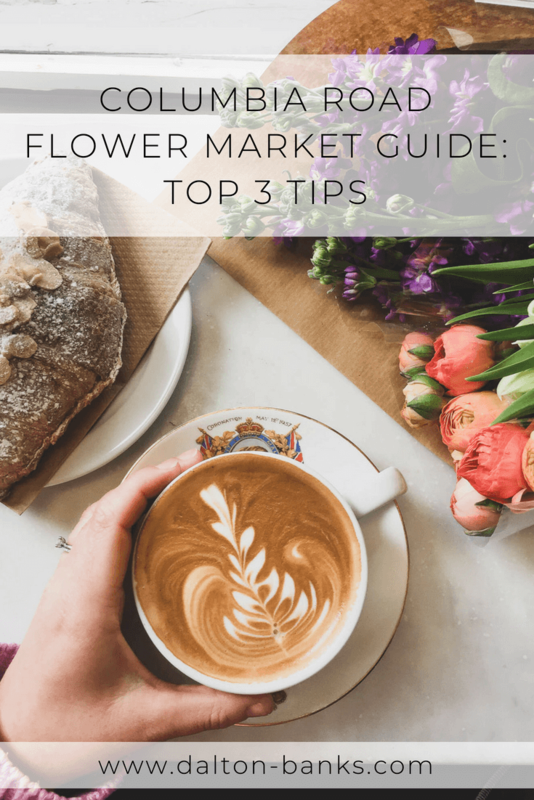 But also make sure you check the grade – especially with flowers like peonies, one stall may be cheaper but they may not be very good peonies. The prices of plants vary more and also, I always like to make sure I’ve got the best one! If you’re like me you will want to take a thousand photos of the flowers, the buildings and the people! But, some of the stall holders don’t take too kindly to you taking 100 photos of their flowers and not buying a single stem from them. I sometimes sneakily snap away, or if I’ve bought flowers from a stall I feel happy to take a lot. I have seen stall holders call ‘photographers’ out on it. Remember this is their job and they want the people buying at the front. Just be a bit mindful. Do you have a touristy place in London that you love but have your own way to get around the crowds? Franks Rooftop Bar for incredible views over London!